It's only an eight-foot journey but lots of things can go wrong when loading a dirt bike into a pickup truck, and Murphy's Law always seems to hover over the loading process. It's fairly easy getting the dirt bike halfway up the ramp, but then comes the big step into the truck bed which is where many of the mishaps occur. There really aren't any 'how to load a dirt bike secrets', but a having a good set of ramps (along with some practice) is an important factor. Wooden ramps and metal ramps are the two most popular options, and each has their pluses and minuses. Wooden dirt bike ramps have been around for a long time. They're readily available, inexpensive, and you can easily cut them down if they're too long. There are, however, several drawbacks to wooden ramps. There's no easy way to secure them to the truck so they're more prone to kicking out when loading a bike, especially for beginners. They're not as strong as metal ramps and they can be very slippery when wet. Backing the bike out of the truck is more difficult because the end of the wood ramp sticks up due to the thickness of the wood and the angle of the ramp. The small metal ramp adapters (Amazon) that attach to the ends of the wooden planks make it much easier to get the bike's tire onto the plank, but check that the metal adapters have some kind of padding on the bottom so you don't scratch your tailgate. Wooden ramps work really well if you have a small embankment to back up to so you can lower the ramp's angle, but you'll need a similar layout at the destination end. Most metal ramps are usually made of some kind of lightweight aluminum composite and come as single ramps, double ramps, or triple bi-fold ramps that can also be used for loading ATVs and lawn mowers. Most of the single ramps are folding ramps which are good for those with shortbed trucks and most folding ramps fold down to around four feet. The bi-fold and tri-fold ramps make loading the dirt bike onto the truck bed a lot easier because you have one side of the ramp for the bike, and one side of the ramp for the person loading the bike. 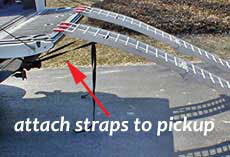 When buying runged loading ramps take a look at the rung spacing before buying. The closer the rungs the easier (and safer) it will be to walk the dirt bike up the loading ramp. The closer the rung spacing the more expensive the ramp, but if it prevents twisted ankles and/or dropped bikes, its worth the extra cost. Unless you run them over, metal ramps will last for years and they have much greater load bearing capacities than wooden ramps. Almost all metal ramps have some sort of strap to attach them to the pickup which lessens (but doesn't totally eliminate) the risk of the ramps kicking out, so be sure to use them. The only real drawback is their cost, but they last a long time and hold their value well so you can always sell them if they're no longer needed. 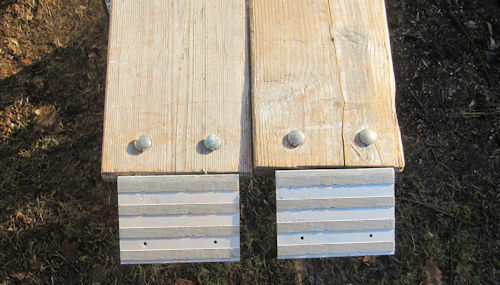 if you bought a rung-type ramp and find the rungs difficult, try placing a 2x6 (or 2x8) in the center of the ramp (remebering that wood can be slippery). most metal ramps are just over 7' long, so make sure you'll be able to fit them in your truck's bed to get them to your destination.